Jesus, or Jesus of Nazareth, also known as Jesus Christ, is Christianity's central figure, both as Messiah and, for most Christians, as God incarnate. In Islam and the Bahá'í Faith, he is regarded as a major prophet. The primary sources about Jesus are the four canonical Gospel accounts, which depict him as a Jewish preacher, healer and God himself; often at odds with Jewish authorities — who was crucified in Jerusalem during the rule of the Roman prefect Pontius Pilate. 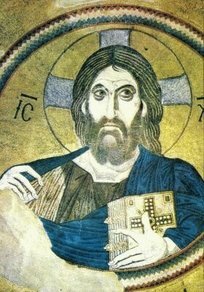 In addition to the four Gospels, a dozen or so non-canonical texts also exist, among which the Gospel of Thomas is believed by some textual critics to predate the Gospels of the traditional canon. Most Christians believe in one God that is a trinity composed of three persons, that Jesus is the second person of that trinity, and also that he is the Messiah (Greek: Christos) prophesied in the Old Testament (or Hebrew Bible). Most Christians also believe that Jesus died on the cross and rose from the dead, and that through him they can be saved. Muslims believe that he was one of God's most important prophets and also the Messiah, though they attach a different meaning to this than Christians, as they do not share the Christian belief in the divinity of Jesus. The canonical Gospel accounts focus primarily on Jesus' last one to three years, especially the last week before his crucifixion, which, based upon mention of Pilate, would have been anywhere from the years 26 to 36 in the current era. The earlier dating agrees with Tertullian (died 230) who, in Adversus Marcionem xv, expresses a Roman tradition that placed the crucifixion in the twelfth year of Tiberius Caesar. A faulty 6th century attempt to calculate the year of his birth (which according to recent estimates could have been from 8 BC/BCE to 4 BC/BCE) became the basis for the Anno Domini system of reckoning years (and also the chronologically-equivalent Common Era system). The historicity, teachings and nature of Jesus are subject to debate. The earliest New Testament texts which refer to him are Paul's letters, which are usually dated from the mid-first century. The only recorded times when Paul saw Jesus were in visions, but he claimed they were divine revelations and hence authoritative. Many modern scholars hold that the works describing Jesus (primarily the Gospel accounts) were initially communicated by oral tradition and were committed to writing as soon as several decades after the Crucifixion. Some believe that these texts may not have retained the same level of historical accuracy as direct first-hand accounts written during or soon after the life of Jesus. However, some scholars argue for a high degree of historical reliability of the key New Testament events, and some also for early dates of the entire New Testament. Although the exact level of the historical accuracy contained in these texts is debated, the vast majority of scholars agree that the actual existence of a historical Jesus is likely. The most detailed information about Jesus' birth and death is contained in the Gospel of Matthew and the Gospel of Luke. There is considerable debate about the details of Jesus' birth even among Christian scholars. Few, if any, scholars claim to know either the year or the date of his birth or of his death. Based on the accounts in the Gospels of the shepherds' activities, the time of year depicted for Jesus' birth could be spring or summer. However, as early as 354, Roman Christians celebrated it following the December solstice in an attempt to replace the Roman pagan festival of Saturnalia. Before then, Jesus' birth was generally celebrated on January 6 as part of the feast of Theophany, also known as Epiphany, which commemorated not only Jesus' birth but also his baptism by John in the Jordan and possibly additional events in Jesus' life. In the 248th year of the Diocletian Era (based on Diocletian's acsension to the Roman throne), Dionysius Exiguus attempted to pinpoint the number of years since Jesus' birth, arriving at a figure of 753 years after the founding of Rome. Dionysius then set Jesus' birth as being December 25 1 ACN (for "Ante Christum Natum", or "before the birth of Christ"), and assigned AD 1 to the following year — thereby establishing the system of numbering years from the birth of Jesus: Anno Domini (which translates as "in the year of the Lord"). This system made the then current year 532, and almost two centuries later it won acceptance and became the established calendar in Western civilization due to its championing by the Venerable Bede. However, based on a lunar eclipse that Josephus reports shortly before the death of Herod the Great, the birth of Christ would have been some time before the year 4 BC/BCE, probably 5 or 6 BC/BCE. This estimate itself relies on the historicity of the New Testament story involving Herod around the time of Jesus' birth. Having fewer sources and being even further removed in time from the authors of the New Testament, details surrounding Jesus' birth are regarded, even by many believers, as less likely to be historical fact, and therefore establishing a reliable birth date is particularly difficult. As for Jesus' death, the exact date is also unclear. The Gospel of John depicts the crucifixion just before the Passover festival on Friday 14 Nisan, called the Quartodeciman, whereas the synoptic gospels describe the Last Supper, immediately before Jesus' arrest, as the Passover meal on Friday 15 Nisan. Further, the Jews followed a lunisolar calendar with phases of the moon as dates, complicating calculations of any exact date in a solar calendar. According to John P. Meier's A Marginal Jew, allowing for the time of the procuratorship of Pontius Pilate and the dates of the Passover in those years, his death can be placed most probably on April 7, 30 or April 3, 33 or March 30, 36. Hyam Maccoby and other scholars have pointed out that several details of the Triumphant Entry into Jerusalem - the waving of palm fronds, the Hosanna cry, the proclamation of a king - are connected with the Festival of Sukkot or Tabernacles, not with Passover. It is possible that the Entry (and subsequent events, including the Crucifixion and Resurrection)in historical reality took place at this time - the month of Tishri in the Autumn, not Nisan in the Spring. There could have been confusion due to a misunderstanding, or a deliberate change due to doctrinal points. According to the texts of Christianity, Jesus was born in Bethlehem to Mary, a virgin, via the Holy Spirit. Joseph, Mary's betrothed husband, appears only in stories of Jesus' childhood; this is generally taken to mean that he was dead by the time of Jesus' ministry. In the Gospels, Jesus' birth is attended by visits from shepherds who were told of the birth by angels. Magi ("Wise Men") from the East were guided by a star to his location some months later. Mark 6:3 (and analogous passages in Matthew and Luke) reports that Jesus was "Mary's son and the brother of James, Joseph, Judas and Simon," and also states that Jesus had sisters. The 1st century Jewish historian Josephus and the Christian historian Eusebius (who wrote in the 4th century but quoted much earlier sources now unavailable to us) refer to James the Just as Jesus' brother (See Desposyni). However, Jerome argued that they were Jesus's cousins, which the Greek word for "brother" used in the Gospels would allow. This was based on the Roman Catholic and Eastern Orthodox tradition that Mary remained a perpetual virgin, thus having no biological children before or after Jesus. Luke's Gospel records that Mary was a relative of Elizabeth, mother of John the Baptist (Luke 1:36). The Bible, however, does not exactly reveal how Mary and Elizabeth were related. Nazareth in Galilee is represented as his childhood home. Only one incident between his infancy and his adult life is mentioned in the canonical Gospels (although New Testament apocrypha go into these details, some quite extensively). At the age of twelve, Jesus was left behind by his parents after a pilgrimage to Jerusalem. On being missed, he was found 'instructing the scholars in the temple'. Just after he was baptized by John the Baptist he began his public teaching; he is generally considered to have been about thirty years old at that time. Jesus used a variety of methods in his teaching, such as paradox, metaphor and parable. His teaching frequently centered on the Kingdom of God, or Kingdom of Heaven. Some of his most famous teachings are in the Sermon on the Mount, which also contains the Beatitudes. His parables (or stories with a hidden meaning) include the parable of the Good Samaritan, and the Prodigal Son. Jesus had a number of disciples. His closest followers were twelve apostles, headed by Peter. According to the New Testament, Jesus also performed various miracles in the course of his ministry, including healings, exorcisms, and raising Lazarus from the dead. Jesus frequently put himself in opposition to the Jewish religious leaders including the opposing forces of Sadducees and Pharisees. His teaching castigated the Pharisees primarily for their legalism and hypocrisy, although he also had followers among the religious leaders (see Nicodemus). In his role as a social reformer, and with his followers holding the inflammatory view that he was the Jewish Messiah, Jesus threatened the status quo. Jesus preachings included the forgiveness of sin, life after death, and resurrection of the body. Jesus also preached the imminent end of the current era (a???) of history, or even the literal end of the world; in this sense he was an apocalyptic preacher. Some interpretations of the text, particularly amongst Protestants, suggest that Jesus opposed stringent interpretations of Jewish law, supporting the spirit more than the letter. In Josephus, Antiquities of the Jews, Book 18, chapter 3, paragraph 1, we learn that Pontius Pilate began his administration of Judea by ordering Eagle Standards with images of the emperor set up in Jerusalem ("whereas our law forbids us the very making of images"). Thousands of Jewish people descended on Caesarea to ask the standards' removal. When Pilate refused, the Jews fell prostrate around his house for five days and nights. Pilate threatened them with death, ordering his soldiers to circle around them. They "laid their necks bare", and replied that they would rather die than see the Torah violated. Pilate gave in and ordered the standards removed. Josephus does not say who inspired and organized this major act of Nonviolent Resistance, but in the third paragraph, just two paragraphs later, he tells of the Crucifixion of Jesus by Pilate - though he does not say for what crime was he executed, if any. (This section of Josephus contains obvious Christian interpolations in most texts, but the Arabic version seems to be free of these.) It could be plausibly argued that the organizer of the Caesarea resistance was Jesus himself - no alternative candidate presents himself - though it may be that the activitiy was generated spontaneously from general reports. It is rather implausible that such a major popular action was carried out, and kept within the bounds of nonviolence, without a very charismatic leader to inspire it and lead it. If Jesus did have a hand in this action, the Gospels show no sign of it. This would be part of the general tendency of the Gospel writers to distance Jesus from his own people and to absolve the Romans for his death. Such an action as the Caesarea Protest would have offered a major reason for Pilate to order his Crucifixion. Therefore, Gospel writers would have good reason, from their point of view, to avoid any mention of it. Jesus came with his followers to Jerusalem during the Passover festival, and created a disturbance at the Temple by overturning the tables of the moneychangers there. He was subsequently arrested on the orders of the Sanhedrin and the High Priest, Joseph Caiaphas. He was identified to the guards by one of his apostles, Judas Iscariot, who is portrayed as having betrayed Jesus by a kiss. He was condemned for blasphemy by the Sanhedrin and turned over to the Romans for execution - not for blasphemy, but for sedition against the Empire. According to the canonical gospel accounts (Matthew 27:24-26, Mark 15:15, Luke 23:24-25, John 19:16a), Pontius Pilate, bowing to the Jewish religious leaders' pressure, handed Jesus over (paredoken) (to his Roman soldiers) to be crucified. Some scholars argue that it was an ordinary Roman trial of a rebel, whose Messianic claims made him especially dangerous, but the Gospels consistently paint the sedition charge as a strained treatment of Jesus' theological position, a tactic used by the Jewish religous leadership as a method to force Pilate's hand(See Barabbas.). All four Gospel accounts mention that the charge noted on the tablet called the titulus crucis, attached by orders of Pilate atop the cross, included the term "King of the Jews", though Pilate is represented as having found nothing inherently seditous in Jesus' kingdom conception. In art the titulus crucis is often written as INRI, the Latin acronym for "Jesus of Nazareth, King of the Jews." Following the crucifixion, Joseph of Arimathea obtained Pilate's permission to take down Jesus' body and lay it into his own new tomb. This was observed by Mary and other women, notably Mary Magdalene. In accordance with the four canonical Gospel accounts Christians believe that Jesus was raised from the dead on the third day after his crucifixion. This article of faith is referred to in Christian terminology as the Resurrection of Jesus Christ; and each year at Easter (on a Sunday) it is commemorated and celebrated by most groups who consider themselves Christians. No one was a witness to the event of the resurrection. However, the women who had witnessed the entombment and the closure of the tomb with a great stone, found it empty when they arrived on the third day to anoint the body. The Synoptic Gospel accounts further state that an angel was waiting at the tomb to explain to them that Jesus had been resurrected, though the Gospel according to John makes no mention of this encounter. The sight of the same angel had apparently left the guards unconscious (cf. Matthew 28:2-4) that according to Matthew 27:62-66 the high priests and Pharisees, with Pilate's permission, had posted in front of the tomb to prevent the body from being stolen by Jesus' disciples. Mark 16:9 says that Mary Magdalene was the first to whom Jesus appeared very early that morning. John 20:11-18 states that when Mary looked into the tomb, two angels asked her why she was crying; and as she turned round she initially failed to recognise Jesus – even by his voice – until he called her by her name. The Gospel accounts and the Acts of the Apostles tell of several appearances of Jesus to various people in various places over a period of forty days before he "ascended into heaven". Just hours after his resurrection he appeared to two travellers on the road to Emmaus. To his assembled disciples he showed himself on the evening after his resurrection, when Thomas was however absent, though he was present when Jesus repeated his visit to them a week later. Thereafter he went to Galilee and showed himself to several of his disciples by the lake and on the mountain; and they were present when he returned to Bethany and was lifted up and a cloud concealed him from their sight. The resurrection of Jesus is almost universally denied by those who do not follow the Christian religion. Most Christians — even those who do not hold to the literal truth of everything in the canonical Gospel accounts — accept the New Testament presentation of the Resurrection as a historical account of an actual event central to their faith. Therefore, belief in the resurrection is one of the most distinctive elements of Christian faith; and defending the historicity of the resurrection is usually a central issue of Christian apologetics. However, some liberal Christians do not accept that Jesus was raised bodily from the dead, or that he still lives bodily (e.g. John Shelby Spong). Jesus is derived from the Koine Greek ??s??? (Iesoûs) via Latin. The earliest uses of Iesoûs are found in the writings of Philo of Alexandria, Josephus, and the Septuagint, as a transliteration of the Hebrew name Yehoshua (????? — known in English as Joshua when transliterated directly from Hebrew), and also Yeshua (????). Jesus' original name is not reported by contemporary or near-contemporary sources, but modern scholars have suggested that Jesus' name was the Aramaic ???? / Yešûa? (as in the Syriac New Testament) a shortened form of Yehoshua used in Ezra, Nehemiah and Chronicles), which was a fairly common name at the time. Josephus, a first century Jewish historian, mentions no fewer than nineteen different people with this name, about half of them contemporaries of Jesus of Nazareth. Other Aramaic forms of the name include Yeshu`, Ishu`, and Eshu`. His patronymic would have been, bar Yosef, for "son of Joseph". Some scholars speculate that Jesus was also known as "Bar Abba" ("Son of the Father") because many times in the Gospels he addressed God as "Father". The Aramaic word for "father" (Abba) survives still untranslated in Mark 14:36. Such speculations are largely in connection with further theories concerning Barabbas. The Arabic form of the name used by Christians, following Syriac, is Yasu`. Muslims, following Qur'anic usage, refer to him by the name `Isa (possibly cognate with the Hebrew name Esau). Christ is not a name but a title, which comes from the Greek ???st?? (Christos) via Latin, meaning anointed with chrism. The Greek form is a liberal translation of Messiah from Hebrew mashiach (????) or Aramaic m'shikha (????? ), a word which occurs often in the Hebrew Bible and typically refers to the "high priest" or "king". The word mashiach in Hebrew means anointed (a cognate in English is "massage," from the Arabic for "vigorous rubbing with aromatic oils") , because the Israelite kings were anointed with oil. The title does not imply, either in Greek or in Hebrew, a divine nature for the possessor of it. In fact, it would seem prima facie that an inherently divine being would not be in need of being anointed. The title Christ is also sometimes identified with the Greek chrestos, meaning "good", although the words are unrelated in terms of etymology, and Chrestus was often used as a pet name for slaves. The Gospels record Jesus referring to himself both as Son of Man and as Son of God, but not as God the Son. However, some scholars have argued that Son of Man was an expression that functioned as an indirect first person pronoun, and that Son of God was an expression that signified "a righteous person". Evidence for these positions is provided by similar use by other persons than Jesus at a similar time to the writing of the Gospels, such as Jewish priests and judges. In the Gospels, Jesus has many other titles, including Prophet (a title that he applied to himself, unlike others), Lord, and King of the Jews. Together, the majority of Christians understand these titles as attesting to Jesus' divinity. Some historians argue that when used in other Hebrew and Aramaic texts of the time, these titles have other meanings, and therefore may have other meanings when used in the Gospels as well. The title Jesus the Nazarene may be a reference to a place of origin called Nazareth, or to a Jewish sect called the Nazarenes. It is often translated Jesus of Nazareth to support the former hypothesis. The world in which Jesus lived was volatile, marked by cultural and political dilemmas. Culturally, Jews had to grapple with the values and philosophy of Hellenism, and the imperialism of Rome, together with the paradox that their Torah applied only to them, but revealed universal truths. This situation led to new interpretations of the Torah, influenced by Hellenic thought and in response to Gentile interest in Judaism. All of the land of Israel belonged to the Roman Empire at the time of Jesus' birth. It was directly ruled by the Idumaean Herod the Great who was appointed King of the Jews in Rome in 39 BC/BCE by Mark Antony and Octavian. In AD 6/6CE, Octavian, recently designated Roman Emperor and renamed as Augustus, deposed Herod's son Herod Archelaus. He combined Judea, Samaria, and Idumea into Iudaea Province which was placed under direct Roman administration and supervision by a Roman prefect who appointed a Jewish High Priest for Herod's Temple in Jerusalem. This situation existed, more or less, till 64 and the start of the Great Jewish Revolt. Galilee, where Jesus grew up according to the Gospels, remained under the jurisdiction of another of Herod's sons, Herod Antipas, Tetrarch of Galilee and Perea, from 4 BC/BCE to AD 39/39 CE. At this time Jesus' childhood hometown of Nazareth (Hebrew, Natserath) was, as revealed by archaeology, a tiny hamlet of a few hundred inhabitants. It had no synagogue, nor any public buildings. No gold, silver or imported goods have been found in it by archaeological excavation. According to Josephus, within 1st century Judaism there were several sects, primarily the Sadducees, closely connected with the priesthood and the Temple, and the Pharisees, who were teachers and leaders of the synagogues. They resented Roman occupation, but, according to historian Shaye Cohen (1988), were in Jesus' time relatively apolitical. In addition, isolated in small communities from these main groups, by choice, some even taking to remote desert caves in anticipation of the end times, lived the Essenes, whose theology and philosophy are thought, by some scholars, to have influenced Jesus and/or John the Baptist. Many Jews hoped that the Romans would be replaced by a Jewish king (or Messiah) of the line of King David — in their view the last legitimate Jewish regime. Most people at that time believed that their history was governed by God, meaning that even the conquest of Judea by the Romans was a divine act. Therefore the Romans would be replaced by a Jewish king only through divine intervention. Some, like John the Baptist in the first half of the century, and Yehoshua ben Ananias in the second half, claimed that a messianic age was at hand. Josephus' Jewish Antiquities book 18 states there was a "fourth sect", in addition to Sadducees, Pharisees and Essenes, which scholars associate with those he called Zealots. They were founded by Judas of Galilee and Zadok the Pharisee in the year 6 against Quirinius' tax reform and "agree in all other things with the Pharisaic notions; but they have an inviolable attachment to liberty, and say that God is to be their only Ruler and Lord." (18.1.6) They believed that the kingdom should be restored immediately, even through violent human action, and advocated direct action against the Romans. Roman reaction to the Zealots eventually led to the destruction of Herod's Temple by Vespasian in August of 70 CE, and the subsequent decline of the Zealots, Sadducees and Essenes. Jesus' language was most probably Aramaic; see Aramaic of Jesus. He may also have spoken other languages of the time, such as the Jewish liturgical language Hebrew, and the administrative language, Greek.